Jean S. Wierig was born on January 3, 1929 in Chicago to Rudolph and Victoria (nee Keller) Sauter. 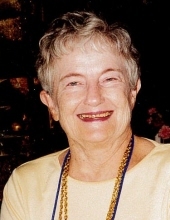 She died Monday, October 22, 2018 in Glenview. Mrs. Wierig worked as a Bookkeeper for Mobil Oil in Glenview and Scott Foresman. Jean and her beloved husband Alfred loved to Square Dance and became quite proficient at this activity which gave them both great joy and friendships. Jean loved to spend time with her family, especially her grandchildren and great-grandchildren, and was loved by all. Jean is survived by her children, Victoria (Russ S.) Wierig and Richard (Noreen) Wierig; grandchildren, Kevin (Toni) Wierig, Emily (Vince) DiPrima and Anthony Wierig; great-grandchildren, Roxanne Wierig and Thomas DiPrima; nephew and niece, Stephen (Lainie) Sauter, and Sally (the late Jim) McDonald. She was preceded in death her husband, Alfred Wierig; brothers, Edward Sauter and Rudolph Sauter. Visitation Sunday, October 28, 2018 from 12:00 pm until 4:00 pm, Sunday, with a 2:00 pm Funeral Service at Glueckert Funeral Home Ltd., 1520 North Arlington Heights Road (4 blocks south of Palatine Road), Arlington Heights, IL 60004. Interment is private. "Email Address" would like to share the life celebration of Jean S. Wierig. Click on the "link" to go to share a favorite memory or leave a condolence message for the family.